Motto: "The ocean depths conceal all intentions." Detecting Predacon activity from over 20,000 fathoms below the ocean surface, Cybershark hunts his enemies at over 600 knots. From ther, little room is left for escape. Armor piercing, jaw mounted sonar tracer torpedoes have water-to-air capabilities. Spin drive tail bossts speed and acts as a quaddrabladed razor weapon in attack and robot modes. Also deploys thruster jets for higher speed and limited low level flight. A fierce warrior, Cybershark honed his skills while bounty hunting a rogue band of Cybertronian space pirates. 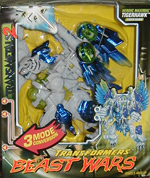 Fully dedicated to the Maximal cause, he often follows his own methods to the frustration of his commander, Depth Charge. Calculating and fearless, he gives the Predacons a good reason to stay out of the water.